What Is The Right Whiteboard Surface For My Needs? Not many people know that there are many types of whiteboard surfaces on the market. Sure, everyone likes a bargain, but choosing your whiteboard on cost alone can be a mistake. Yes, if you only need your whiteboard for a one-off event, then going for the cheapest option can make sense. But if you want years of trouble-free writing, then going cheap upfront is going to cost you a lot in terms of cleaning time over the long term. A higher quality board will be easier to use and clean - ensuring your whiteboard is cost-effective for many years to come. At JustBoards, our emphasis isn’t just about selling you a whiteboard. We pride ourselves on providing the best possible service, advice and solutions to you across the full range of all the whiteboards and other display board options we provide. Our expert advice and knowledge will ensure you are completely satisfied with your purchase from the time of order and through many years of productive use. Because we’ve been in the business for over 12 years, we’re confident our knowledge of the products will help you make the best decision on what type of writing surface is the one for you. So, before you go whiteboard shopping, you have to look at other factors, such as frequency and purpose of use, before deciding on what surface is ideal for you. All up, there are five main types of whiteboard surfaces,plus our new and contemporary glassboards. Let’s look at them in more detail. What Is The Cheapest Whiteboard Surface? Each of these kinds of whiteboard surface is relatively porous, meaning that whiteboard ink can ‘sink in’. The common result is ‘ghosting’: where part of the writing remains even after a wipe down. These all need regular intensive cleaning to maintain an acceptable, let alone spotless, appearance. Melamine especially is a laminate coating that will wear down quickly and is prone to scratches or dents. Because of their significant drawbacks, JustBoards does not stock these types of whiteboards. They simply do not measure up to our professional standards nor our promise to you to offer premium-quality products. What Is The Best Whiteboard For My Home Or Small Office? Commercial Whiteboards, also known as acrylic surface whiteboards, are ideal for general use. They feature a high-quality, hard-wearing surface on magnetic steel and are perfect for occasional use - every second day or so. Traditionally, whiteboards have been one of the most popular note-taking methods used across the world. With regular care, a Commercial Whiteboard is a great choice for low to moderate usage in home or general office applications. With a warrantied surface life of 8 years, a Commercial Whiteboard is a great balance of performance, durability and competitive pricing when compared with all other board types available. What Is The Very Best Whiteboard Surface? For the Rolls-Royce of whiteboards, you cannot look past our Porcelain Whiteboards . Featuring an exceptionally high-quality enamel writing surface baked onto a steel backing that allows magnets to adhere, porcelain whiteboards are resistant to surface damage, stains and scratches. This superior surface is great for heavy-duty users: less cleaning is required and markers are less likely to ghost. Porcelain Whiteboards are recommended for use in schools and higher education facilities, conference centres, medical facilities and anywhere they will be needed all day and every day. When only the best will do – with no fuss or trouble, guaranteed – porcelain whiteboards are the toughest. Certainly a more costly board upfront, they offer a highly positive return on investment over the expected 25-year lifespan. For arduous applications, porcelain is a no-brainer. At JustBoards, we’re proud to offer a rather new alternative to traditional whiteboards. 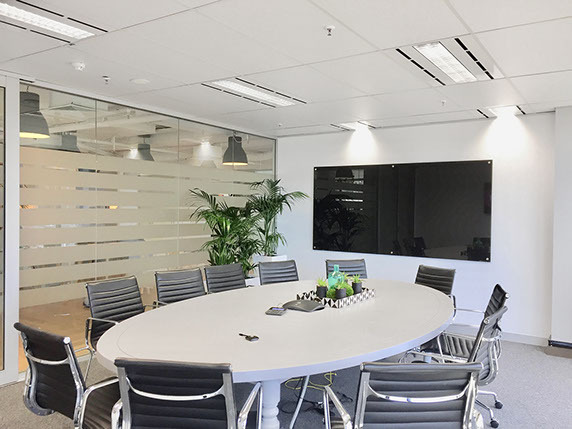 Called Glassboards , they have been designed to blend seamlessly with any decor as highlighted by the translucency and elegance of their premium tempered glass. Glassboards don’t just look great, they’re also great to use. Our lifetime surface warranty guarantees the non-porous surface will never stain or ghost. As with Porcelain Whiteboards, heavy-duty users will benefit over time from the superior performance of Glassboards. They are easier to use, easier to clean and just last and last. A more modern take on the standard whiteboard, Glassboards feature a beautifully sleek and professional look with 4mm toughened safety glass, polished edges and rounded corners. They ‘float’ approximately 20mm from the wall on supplied stand-off fittings. The magnetic range, made with tempered glass laminated to a strong steel sheet, comes standard in white (9 sizes) or black (2 sizes). The non-magnetic designer range (6mm tempered glass) can be manufactured in your choice of any Dulux colour on request. 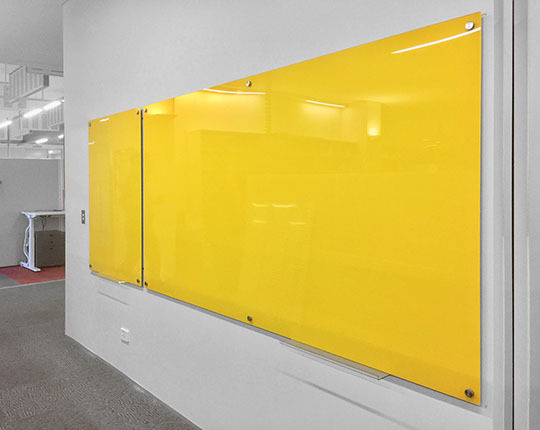 For precise colour-matching, Starphire Glassboards, which also offer extreme clarity, are available. All up, Glassboards can certainly be considered a high-ticket item, yet they are still a justified purchase given their long-term practical lifespan while also offering a premium, contemporary finish. Each type of writing surface, whether a Whiteboard or a Glassboard , has its own advantages. Look closely at the table below to choose the right writing surface for your requirements. We hope this advice on writing surfaces has made it clear what the varying surfaces are and how they can impact your efficiency, whether at home, work or whatever the environment. If you’d like to find out more, JustBoards is keen to provide additional information and advice at all times with no obligation. If you have further questions, please do not hesitate to contact us at 1800 654 917 or by email or chat.